Soft pretzels are just about perfect. They’re chewy, salty and great with everything from a beer to a salad. The thing is: they’re chewy. And gluten-free flour doesn’t do chewy well. But this year I decided I didn’t want to go through another football season or Oktoberfest without a soft pretzel. So I headed into the kitchen. 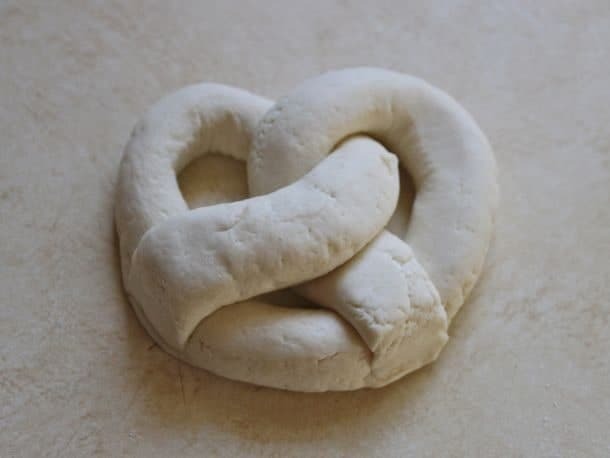 Since gluten, the protein found in wheat and other grains, is responsible for the distinctive soft pretzel chew, I began by focusing on the flour blend. The flavor of pretzels is rather subtle I first used white rice flour and tapioca starch. I hoped the white rice flour would be bland enough to fade into the background while the tapioca starch, along with a little xanthan gum, provided chew. It worked. Sort of. Since I didn’t want bland pretzels, I replaced the white rice flour with brown rice flour. While the flavor was better, the pretzels were unappetizingly grainy. Combining the white rice flour and brown rice flour solved this problem. During testing, I increased the amount of tapioca starch in the recipe. From previous experience, I knew that too much tapioca starch could make a recipe gummy. I added it cautiously, and one day, after using 3/4 cup of tapioca starch, I pulled a baked pretzel apart. There was some resistance as I tore the pretzel and the crumb had the tight appearance of wheat-based soft pretzels. When I took I bite, the pretzel felt chewy! Finally, a gluten-free soft pretzel that was chewy and flavorful. But texture isn’t the only characteristic unique to soft pretzels. They need to be dark brown and shiny. 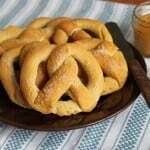 Commercial bakers achieve this by boiling the pretzels in water with a little food-grade lye, a powerful alkaline. The solution turns the dough slightly yellow during boiling and aides the Milliard reaction during baking ,causing the pretzels to darken. Since I didn’t have any lye on hand, (and I’m guessing you don’t either!) I used an alkaline that I did have in the kitchen: baking soda. While baking soda isn’t nearly as powerful an alkaline as lye, it did turn the dough slightly yellow during boiling. The finished pretzels, however, were a little too light for my liking. Adding additional baking soda wasn’t solving the problem. On a whim, I added some granulated sugar to the solution. I hoped the sugar would help turn the pretzel a nice golden brown. It worked! And best of all, the additional sugar didn’t add sweetness to the pretzels, just a lovely golden brown color. Now, with a pretzel in hand, I’m ready for football season! Here’s how to make ’em! You want the dough stiff but not dry. Don’t worry if it doesn’t form a dough ball in the stand mixer. It won’t. After two minutes of mixing, no dry ingredients should cling to the bottom or sides of the mixing bowl. If dry ingredients remain, add one to two tablespoons additional water. Turn dough out onto a lightly white rice floured surface. Don’t use too much flour. A light dusting to prevent the dough from sticking to the counter is all you need. 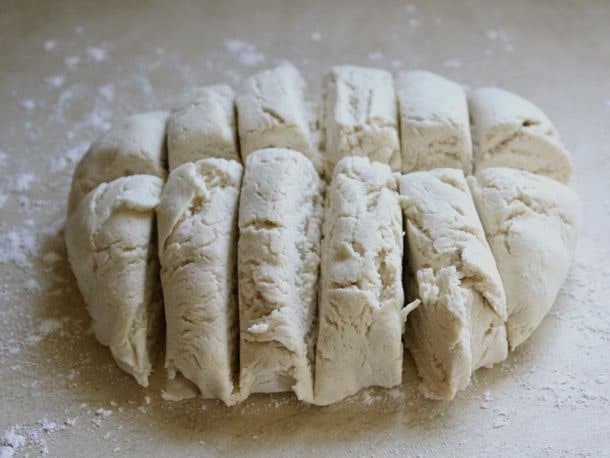 Gently knead dough into a ball. Gluten-free dough requires a light touch. 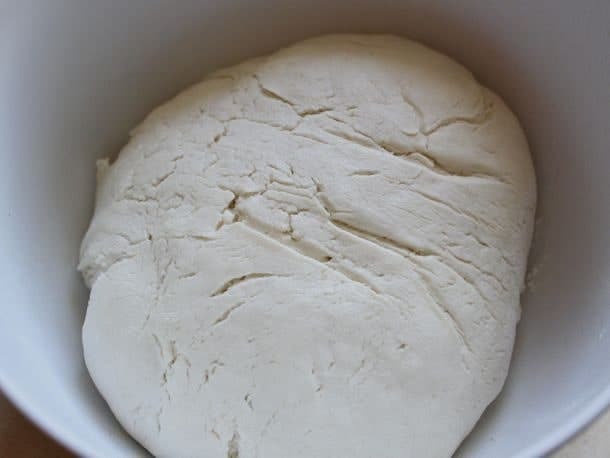 Once the dough forms a ball, stop kneading and place into a lightly oiled bowl to rise. 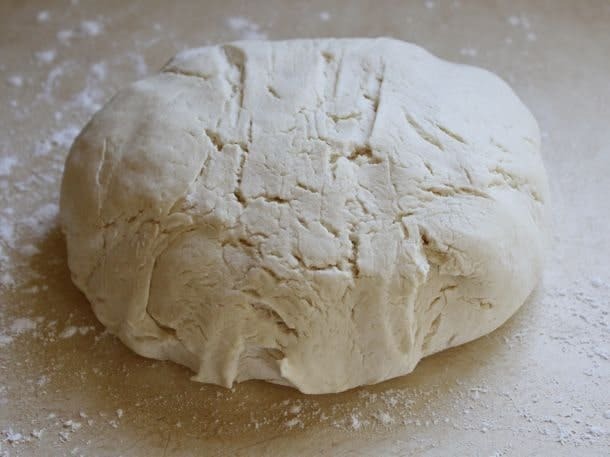 Brush or spray the top of the dough with oil to prevent a skin from forming. 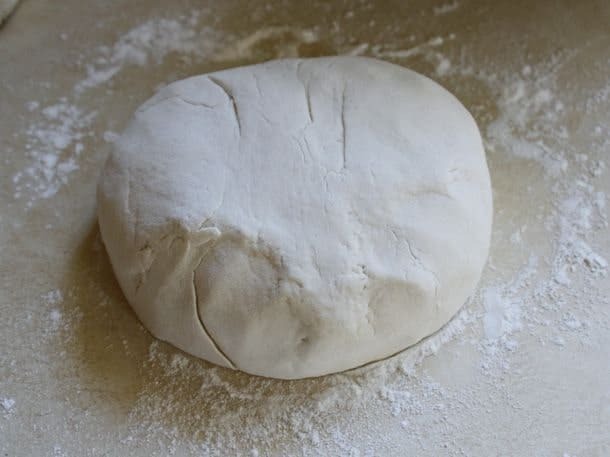 Allow dough to rise until doubled in size. This usually takes about an hour but the time varies depending on temperature. Turn dough onto a very lightly white rice floured counter. Too much flour on the counter makes it hard to shape the pretzels. A light dusting of white rice flour will do. 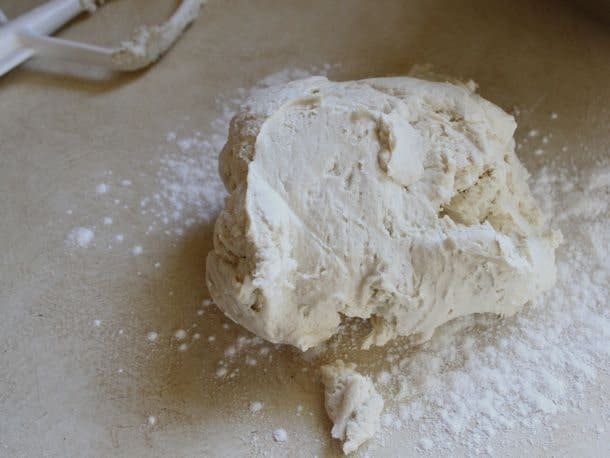 Knead each dough ball until it becomes smooth. It should lose its shaggy appearance. Roll out into 12-inch log. Take care not to use too much flour on the countertop. If the dough has too much flour on the surface, brush it off with a pastry brush. Cover the other pieces of dough with a piece of plastic wrap. Press the ends into the bottom of the “U”. 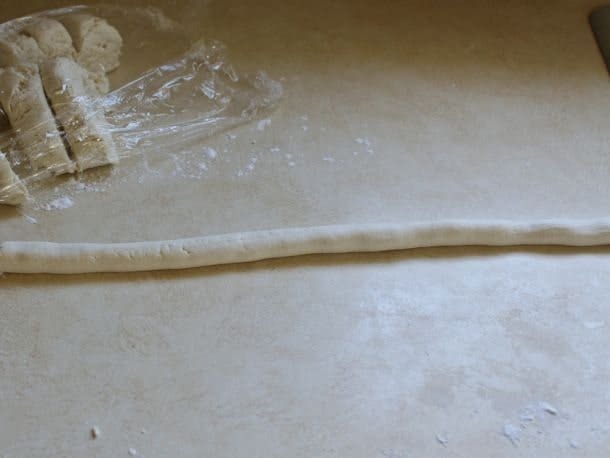 You want to be sure the dough sticks to itself, so it doesn’t come apart while boiling. Boil the pretzels until they float. Once boiled, the pretzels turn slightly yellow. (The four pretzels on the left have been boiled. The two pretzels on the right have not been boiled.) Sprinkle some kosher salt on the pretzels and bake. 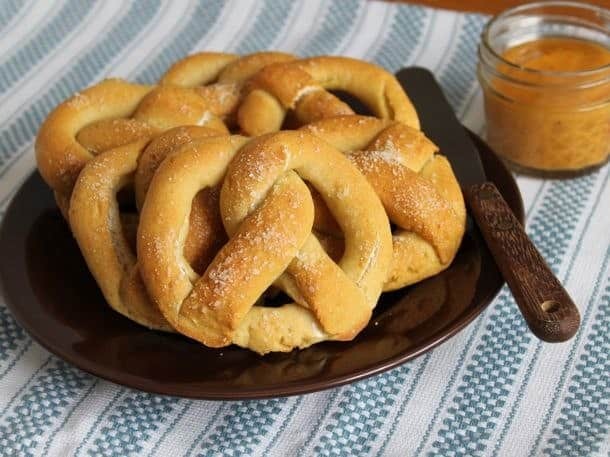 For the Pretzels: In the bowl of stand mixer, combine white rice flour, brown rice flour, tapioca starch, salt, xanthan gum, and baking powder. Whisk to combine. In a small bowl, combine 1 cup warm water and active dry yeast. Stir with a fork. Allow to stand for three minutes. Add water-yeast mixture, egg, light corn syrup, and vegetable oil to dry ingredients. Fit stand mixer with paddle attachment. Mix on medium speed until dough forms, about 4 minutes. The dough should be firm but not dry. 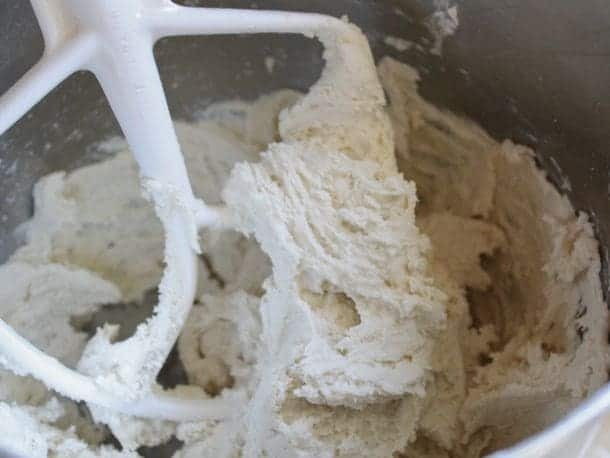 If any dry ingredients remain at the bottom of the bowl or if the dough seems dry, add the additional 2 tablespoons water. Turn dough out onto lightly white rice-floured counter. 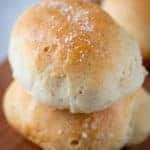 Dust your hands with white rice flour and knead dough into a ball until smooth. Take care not to use too much pressure while kneading. Transfer dough to lightly greased bowl. 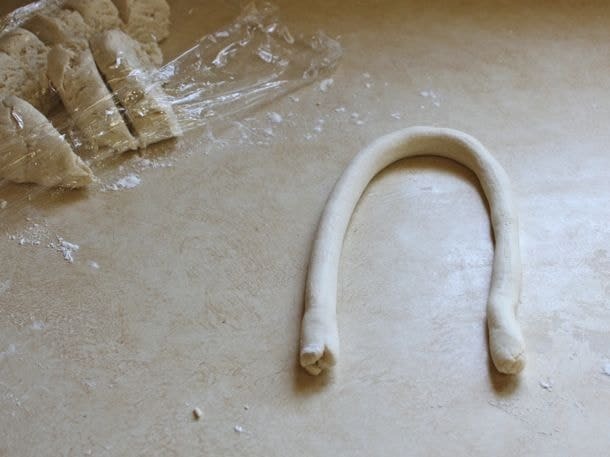 Lightly brush the dough with oil. Cover the bowl with plastic wrap and allow to rise until almost doubled in size, about 1 to 1 1/2 hours. Line two rimmed baking sheets with parchment paper. Working one log at a time, form the dough into a into "u". Twist each end together and then press the rope into the bottom of the "u". 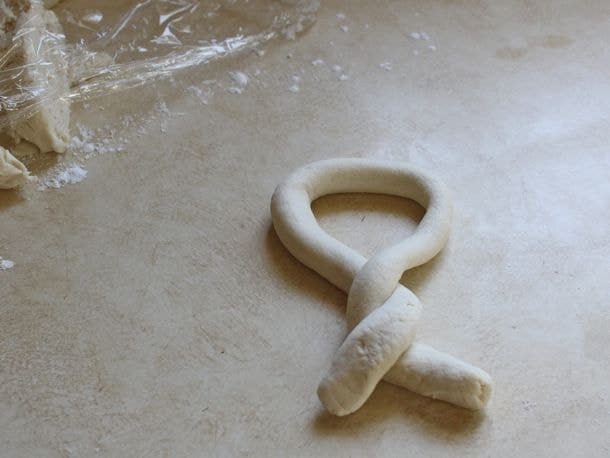 You want to press the dough firmly to ensure the ends stick to the "u" or the pretzel can unravel during boiling. 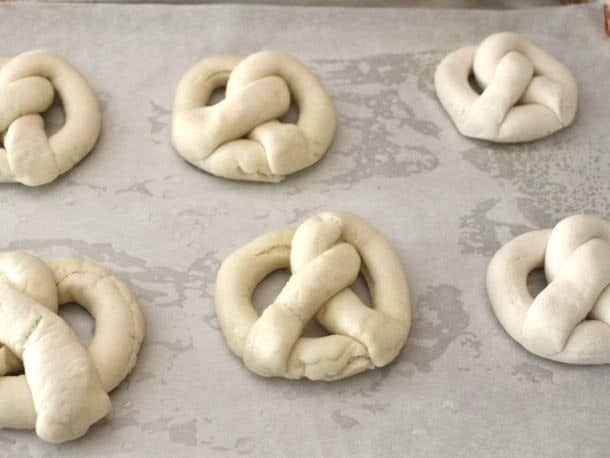 Place shaped pretzels on prepared baking sheet. Prepare the Water Bath: Add the baking soda and granulated sugar to the boiling water. One at a time, boil the pretzels. 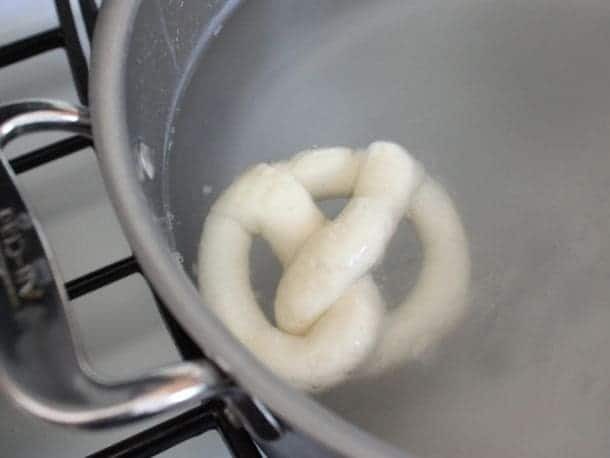 If the pretzel floats, boil for about five seconds. If the pretzel sinks, wait for it to float to the top of the water and then remove. Return boiled pretzels to the prepared baking sheets. Sprinkle generously with kosher or pretzel salt. Bake until golden brown, about 25 minutes, rotating baking sheets halfway during baking. Remove and allow pretzels to cool. Pretzels are best served the day they're made. If desired, freeze once cooled and reheat in a warm oven. Can you tell Me what can be substituted for the the corn syrup and the egg? These look so good, just can’t have either of those ingredients. You could substitute honey for the corn syrup. As for the egg, you could try a flax “egg” but I’m not 100% sure it would work in this recipe. Can I use 1:1 gluten free baking flour? It’s a mix with all the ingredients needed from all the flours. All 1:1 baking flours are different. The recipe might work with the blend; however, it might not. King Arthur, for example, states that their 1:1 flour isn’t good with some yeast recipes. 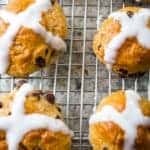 We have made these once but we love this recipe due to the chew and taste. Tried others that were soft pretzels and will not repeat them. Thank you for all the testing as we are so happy to have found this! 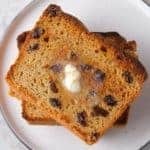 I tried your recipe after reading your notes so please know all the details made me trust that you knew how to really bake gluten free. Great thanks from my son to you! Glad you liked the pretzels! I tried a recipe from a different source, and did something wrong at the boiling stage. Maybe it took too long for me to get all the bites (it was bites, not pretzels) boiled. The baking soda flavor was too strong on the pretzels. I think what happened is that as the water boiled away, the amount of baking soda became too strong. I tried to add water, but obviously that didn’t work. 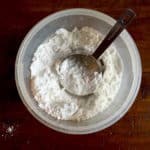 Did you ever encounter a too-strong baking soda flavor? Any tips? Do you think I’m right in my guess? I’m excited to try this recipe! Adding yeast to the shopping list! Nope. I’ve never experienced a strong baking soda flavor. I did have to make two substitutions, as I can’t have corn or eggs. I did an equal sub of agave nectar for the light corn syrup. I replaced the egg with 3 Tbsp of aquafaba (the juice from a drained can of chickpeas). I was worried this substitutions would mess things up, but miraculously they didn’t! Just curious, why do you use corn syrup instead of sugar brown or white? Also, I’m wanting to make bites, is the water to soda ratio different for bites, do I still boil them until they float? Corn syrup holds on to moisture MUCH better than either white or brown sugar. It gives these pretzels the perfect texture. As for the boil, the water to soda ratio remains the same. And, yes, boil until they float! All of this to say … thank you for this recipe (and your efforts in baking)!  My stomach will thank you!